David Duncombe, representing the Kent, Sussex & Surrey Air Ambulance gave a fascinating talk to Club Members. The Air Ambulance is one of President David's nominated charities and it is hoped that the Club will be able to make a substantial donation to this charity at the end of his year in office. David Duncombe illustrated the history and operations of the Air Ambulance service starting with its earliest days when it was a more basic transport service ferrying patients from serious incidents to hospitals for treatment. The operation took a major step forward when it was decided that the Air Ambulance crews should include a full medical team, capable of carrying out A & E surgery in the helicopter at the scene of the incident. Accordingly, specially trained Trauma Paramedics and experienced A & E Consultants are recruited to become part of the helicopter crew and new helicopters, adapted to house an "operating theatre with wings", were purchased. Speed of response is of the utmost importance and whenever a 999 call is received at the ambulance call centre, a specially trained operator monitors the information and decides if an Air Ambulance would be an appropriate response. If it is, a "scramble button" is pressed and the helicopter will be airborne within four minutes of the 999 call. The Air Ambulance has priority over all other air traffic and its flight path is cleared completely by Air Traffic Control. It is reported that, on one occasion, a Royal Flight carrying the Prince of Wales had to be diverted out of the path of the Air Ambulance and a letter was sent by Prince Charles, congratulating the Air Ambulance on its service. The helicopter should be able to reach any location in Kent within 14 minutes. 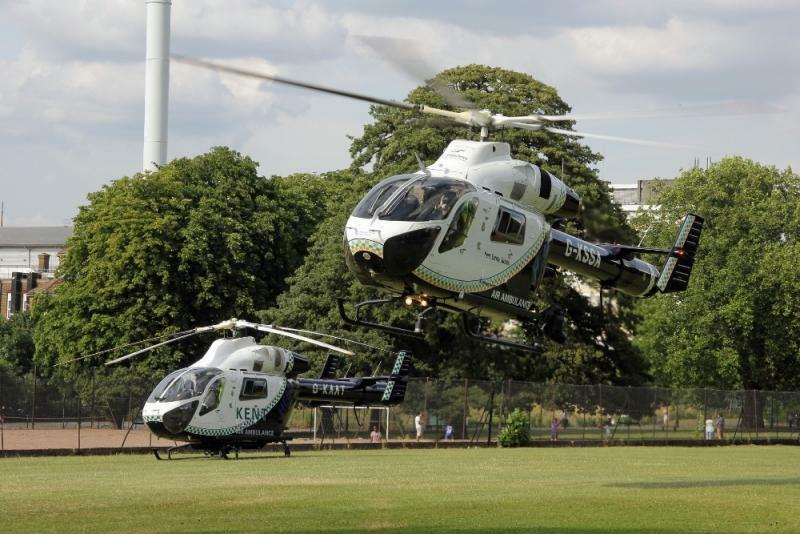 In earlier times, most patients were transported to hospital by the helicopter but now, with the full Trauma team attending, most patients are successfully treated at the scene and can be taken to hospital by land ambulance, freeing the helicopter for another "shout". A major piece of equipment development has revolutionised treatment so that blood transfusions can be made at the scene of an incident. The problem was that blood must be stored at near to freezing point but must be transfused at body temperature. With assistance of a company which makes hair straighteners, a ceramic "radiator" was invented into which the stored blood is pumped and heated to body temperature in just four seconds! The Air Ambulance now carries four pints of "O Negative" blood at all times and this blood is supplied by "Blood Runners" (including our own Charlie Brightling) who transport the blood by motorcycle in case of emergency. Another recent breakthrough has enabled the Air Ambulance to operate at night. The pilot can now use military-grade night vision goggles (which cost an "arm and a leg"!) and together with a co-pilot without goggles who can guide the helicopter down to the incident they can even land in urban environments safely. Club Members were hugely impressed with everything they learnt about the Air Ambulance (and greatly reassured!) and will be making every effort to raise funds to help support this outstanding service which is almost entirely free of public funding.